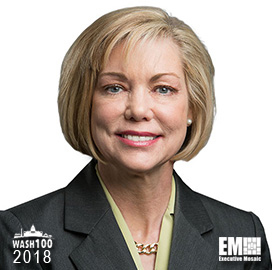 Executive Mosaic is pleased to announce Engility CEO Lynn Dugle as an inductee into the 2018 edition of the Wash100 — Executive Mosaic’s annual selection of the most influential voices in the government contracting arena — for leadership during Engility’s rapid expansion in 2017. Dugle joined Engility in March 2016 after a 12-year tenure at Raytheon, where she previously led the company’s intelligence, information and services segment. Engility launched in August five centers of excellence in a push to advance the development of products across artificial intelligence, cyber, agile software development, modeling and simulation and high-performance computing. Dugle said then that client agencies have collaborated with the Chantilly, Virginia-based government services contractor to help transform concepts into real-world applications. “By concentrating our subject matter and technical expertise under these ENnovation Centers, our customers have easier access to the resources needed to apply today’s solutions and test tomorrow’s technologies,” she added. In addition to the five COEs, the firm also opened a new office in Augusta, Georgia, in an effort to gain access to the area’s cyber talent pool and expand support services to clients at Fort Gordon. The launch of the new office comes as Augusta prepares to become a new cyber hub through the establishment of a $50 million cyber facility by the state of Georgia and the Defense Department’s $2.1 billion investment in a new cyber headquarters in the area. The company also introduced in 2017 an AI platform – Synthetic Analyst – designed to help federal civilian and military users generate data-driven insights and decisions across various operations such as threat detection and analysis; training support; headquarters operations; and course of action planning. Dugle noted that the AI tool works to automate, augment and speed up users’ capacity to access and apply required data in real time. Engility won numerous contracts in 2017 and those include a $170 million recompete contract with NASA for software and systems assurances services and a $119 million contract to support a logistics enterprise resource planning platform used at various U.S. Army and DoD facilities. “Mission readiness is more important than ever, and the Logistics Modernization Program plays a key role in ensuring that our forces are supported by the most advanced logistics and operations technologies possible,” she said then. She sits on the board of directors of Engility and is a member of the Defense Science Board. Executive Mosaic congratulates Lynn Dugle and the Engility team for their selection to receive this award.